The Secretary of the Ministry of Internal Affairs, Bredina Drollet, hosted and chaired the first meeting of the National Steering Committee which has a role of advisory and monitoring of the implementation of the National Policy on Gender Equality and Women’s Empowerment. The meeting was attended by the Secretary of MFEM, Richard Neves, and representatives of the Ministries of Education, Public Service Commission, Infrastructure and Planning, Police, Health, Culture, the National Policy Unit, the National Council of Women and members of the Gender and Development Division. The group plans to meet every six months. In between times, Task Force groups consisting of key stakeholders, have been assigned to each of the six components of the National Policy and will meet on a monthly basis to monitor the achievement of their specific outcomes. Each task force will be expected to submit an annual plan and to report on it to the Steering Committee at their biannual meeting. 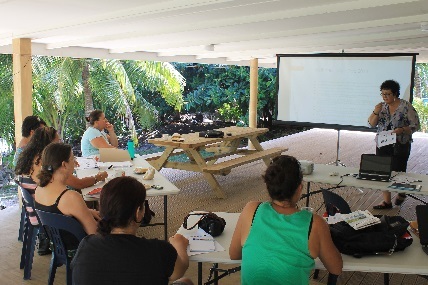 Nani Samuela, Director of PTI, invited the Gender Project Coordinator, Maureen Hilyard, to explain the Gender Project to the Punanga Tauturu Board, and to discuss ways in which the project may be able to assist their NGO to provide for the needs of women at risk of violence in the home. Because of PTI’s long standing role in the community for their support of women’s rights, funds have been allocated from the budget to assist them to carry out their different roles. They are currently putting their budget together to take in the allocations that have been assigned to upgrading their office administration equipment; assisting with the development of a coordinating mechanism (policy) to coordinate the role of PTI in conjunction with the Police, Health and Justice; providing financial support for court appearances (legal aid); and to support a community training programme in the outer islands to help to minimise violence in communities. the Board has requested a copy of the National Gender Policy 2011-2016 which none of them had seen. Unfortunately I only have one copy but this will try to locate an e-copy. Vaine Nooana-Arioka, CEO of the Bank of the Cook Islands, has offered some assistance with training support for women in business. At a meeting with the Project Coordinator, they discussed possible uses for an earlier project that has remaining funds that can be used for jointly common purposes. A referral was also made to a Customer Service Training team who are going to be working on Rarotonga in March, and who could fit in a session with our women, if the schedules will allow. I have been in touch with Doug Gollings of Management Learning Associates. The Project Coordinator was invited to speak to a group of the Chamber of Commerce to explain the Gender project and how they might be able to assist. They suggested some support in the area of mentoring. They are currently resuming a mentoring programme which they are willing to work in partnership with the project. I later provided them with an overview report of the project for the other members of their group. They suggested that I might speak to the full Chamber and will get back to me. I met with Sarah McCawe (Ministry of Education), Pat Farr (National Disability Council), Bob and Gail Kimi (Rotaianga) – apologies from Roger Harkness (Creative Centre) – re the possibility of an Employment Officer who might seek work opportunities for persons with disabilities, and guide them into their new roles. The group will work together to develop a formal proposal. Teuira (Tutu) Pirangi from Highland Paradise, Andrea Rongokea of Wedded Bliss and I were nominated by the Chamber of Commerce to attend the second PIPSO conference held in Fiji. The experience was not only an eye-opener to the many successful businesses across the Pacific but also a realisation that despite the difficulties women in the Cook Islands may experience getting started and maintaining their businesses due to the constraints of some of our government and private sector financial or capacity building policies, our environment for entrepreneurship is much more facilitating than that of some of our sisters in other Pacific countries. Pacific Chambers of Commerce were recognised at the conference for the practical support they give for local businesses. The Gender Equality Project would like to take further advantage of the knowledge and experience of its own local Chamber members to build the businesses of our women entrepreneurs, even to our micro-to-small businesses at the market level. Violence against women, by both men and other women across the Pacific, was also identified as a barrier to the greater contribution that could be made by women in business. These issues were discussed in a dialogue facilitated by the Australian Government’s Ambassador for Women and Girls, Natasha Stott Despoja, on the day before the PIPSO conference. Support was sought for solutions from within the private sector to respond to the costs that can result from violence against women. These costs can directly impact on loss of productivity and service provision for businesses but also on police, health and justice systems, as well as loss of security and income for families. Read more in the Pacific WIB Report to the Cook Islands Chamber of Commerce. 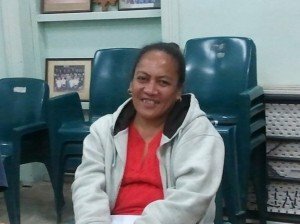 Mahiriki Piho, Welfare officer from Rakahanga was finally able to get back to Rarotonga to undergo training. This included an update of the Gender Project so that she can implement gender principles across the different roles she has as the welfare officer of her island. She was also able to learn about how she can assist the project by feeding back ideas for business opportunities for women, as well as any ideas from the vainetini on the island with regards to assistance with any violence against women issues on her small island. 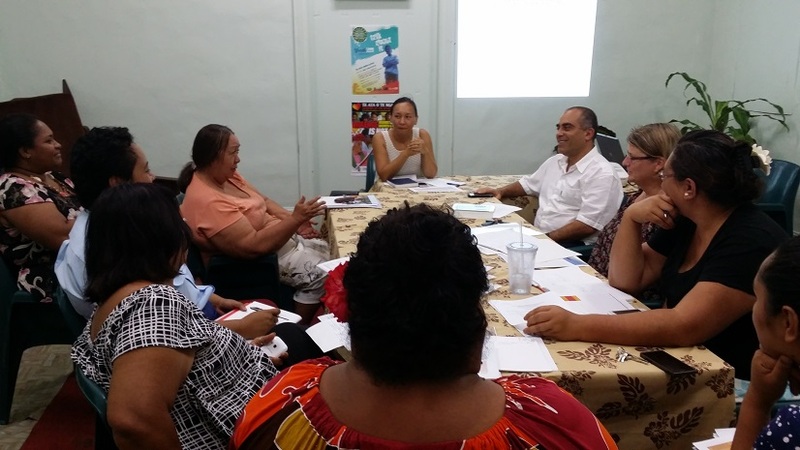 11 August 2014 – Pukapuka Hall – Members of the Pa Enua complement of Welfare Staff of the Ministry of Internal Affairs were introduced to the Gender Equality and Women’s Empowerment Project and its objectives. As Welfare officers they will have an important role in ensuring the safety and wellbeing of families on the island, and therefore the component of the project relating to Violence Against Women will be included into their care responsibilities on the island. Three of the officers are men, and it was explained that the training of men on each of the islands will be as much of a responsibility for these officers as it is for the women on the island. The second component of the Gender project is to do with women’s economic empowerment, and the welfare officers have been asked to feedback any ideas for economic development for women on the islands back to the Gender Project Coordinator. August 6 2014 (USP) – Stakeholder meeting to introduce the outcomes, outputs and tasks involved in the Gender Project. Also to review UN Indicators and the recommendations that came out of the Triennial Women Parliamentarian’s and Women’s meeting held on Rarotonga 2013. Further input was gathered from the group. A strategic planning group will be formed to develop the requirements of the Business Needs Analysis study which will present an analysis of the current environment and provide some recommendations for a required environment on which future project planning will be based to facilitate new business opportunities for women. July 23 and 24, 2014 (USP)- Two stakeholder meetings to build understanding about the project and its objectives, and to gather some collective understanding of the Gender stakeholder environment. Participating stakeholders were asked to consider task groups they may want to become part of during the project.